To mount the mirror, pull the top of the rubber hood off the STI lever clip, slip the mirror base over the lever clip, and place the rubber hood back onto the clip we've cleverly integrated into the mirror base. 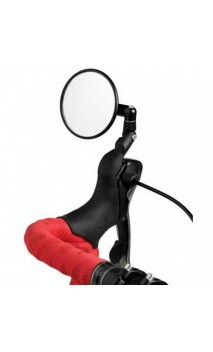 When mounted on the lever, the Mirrycle Road Mirror is located in the very best position for viewing to the rear. Just a flick of your eyes allows for a quick view behind. The Mirrycle Road Mirror can be attached to either the left or right side lever. All necessary tools are included. The mirror part is a 3" diameter round glass convex mirror with a wide field of view. The all-new Mirrycle Road Mirror was developed exclusively to fit Shimano STI* shifter/brake levers while allowing the continued comfortable use of the lever. With a minimum of included parts, the Road Mirror is ingeniously engineered to fit many different STI levers. A lot of emphasis has been placed on the design of the Mirrycle Road Mirror so it blends elegantly with today's bicycle components.